What is the point estimate? How to find the point estimate? If you have gathered a lot of population data and want to find the "best guess" parameter, this point estimate calculator will be right up your alley. It uses four different point estimate formulas to give you the most exact value possible. You can start using the calculator right ahead, or read on to learn more about the principles behind it. Make sure to check out the example at the end to get a better understanding of how to find point the estimate in simple statistical problems. Imagine you're tossing a coin. Every time you toss, you note down the result. For an unbiased coin and sufficiently large number of trials, you should get roughly 50% heads and 50% tails. But what if the coin is biased - for example, slightly bent? Then, after a large number of tosses, you will discover that one of the sides appears more often. It means that the probability of getting heads is different than 50% for that particular coin. The point estimate is exactly that probability of getting a 'heads' result. Once you have tossed the coin enough times and have gathered some data on the coin's "behavior", you will be able to find it with our point estimate calculator. You can use four different point estimate formulas: the Maximum Likelihood Estimation (MLE), Wilson Estimation, Laplace Estimation and Jeffrey Estimation. Each of them gives a slightly different result and should be used in different circumstances. Our point estimate calculator automatically chooses the most relevant result, but you can open the advanced mode to see all of them. Number of successes S: for example, the number of heads you got while tossing the coin. Number of trials T: in the coin example it's the total number of tosses. Confidence interval: the probability that your best point estimate is correct (within the margin of error). Z-score z: it will be calculated automatically from the confidence interval. If MLE ≤ 0.5, the Wilson Estimation is the most accurate. If 0.5 < MLE < 0.9, then the Maximum Likelihood Estimation is the most accurate. If 0.9 < MLE, then the smaller of Jeffrey and Laplace Estimations is the most accurate. If you are still unsure how the procedure of finding the point estimate works, take a look at the example below. We will examine the biased coin problem in more detail. Determine the total number of coin tosses - this will be the number of trials T. Let's assume T = 100. Decide on your confidence interval. Let's say you need to be only 90% sure that your result is accurate, so you settle for the confidence interval of 90%. 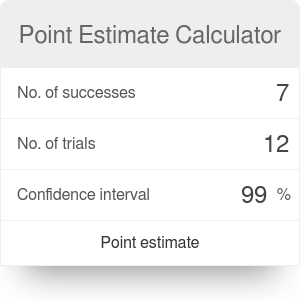 The point estimate calculator will find the z-score for you. If you want more details on how it's calculated, take a look at the p-vale calculator. In this case, z = -1.6447. As the Maximum Likelihood Estimation is greater than 0.9, you should choose the smaller of Jeffrey and Laplace Estimations as the best point estimate. In this case, it is equal to 0.9118. It means that the probability of getting heads with this coin is equal to 91.18%. Point Estimate Calculator can be embedded on your website to enrich the content you wrote and make it easier for your visitors to understand your message.